Hello and welcome to My Kitchen Serenity! Thank you for visiting my blog. 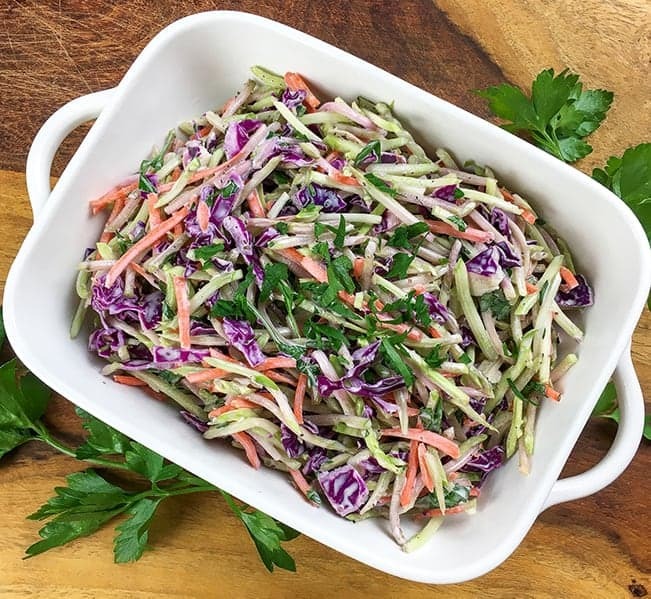 Now, let’s talk about this super simple Broccoli Slaw! This is our favorite time of the year. Summer is coming and that means cookouts and more time outdoors. 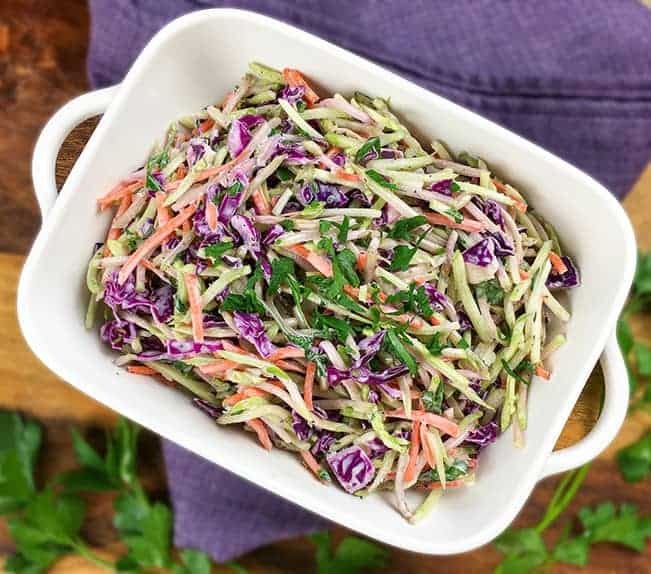 Hello, broccoli slaw! This quick and easy recipe is perfect for those spring and summer days when you want a light and tasty side dish without extra time in the kitchen. Just toss the ingredients into a large bowl, stir, and serve! Creamy avocado oil mayo combined with a hint of apple cider vinegar makes it the best dressing for broccoli slaw. We love it! But you may ask, “Why Use Avocado Oil Mayo”? We like using avocado oil mayonnaise because it’s a great healthy fat, rich in oleic acid (a monounsaturated omega-9 fatty acid). We like Primal Kitchen Avocado Oil Mayo. And, if you’re watching carbs, the net carb count of avocado mayo is super low. Primal Kitchen Avocado Oil Mayo has 0 net carbs per serving (always check the nutrition label) and great for keto and paleo diets. But if you prefer to use regular mayo, then use it, honey! Spring and summer come with holidays, too. There’s Easter, Memorial Day, Mother’s Day, Father’s Day, and Fourth of July just to name a few (well, more than few actually)! Summer holiday meals don’t have to mean a lot of time in the kitchen or a heavy meal. 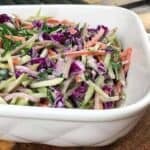 Coleslaw goes great with pulled pork sandwiches, hamburgers, and grilled chicken. Quick Note: This post contains an affiliate link(s). Please read my disclosure statement for more details. Delicious nutritious broccoli makes a great slaw! Buy it already shredded and save yourself some time. 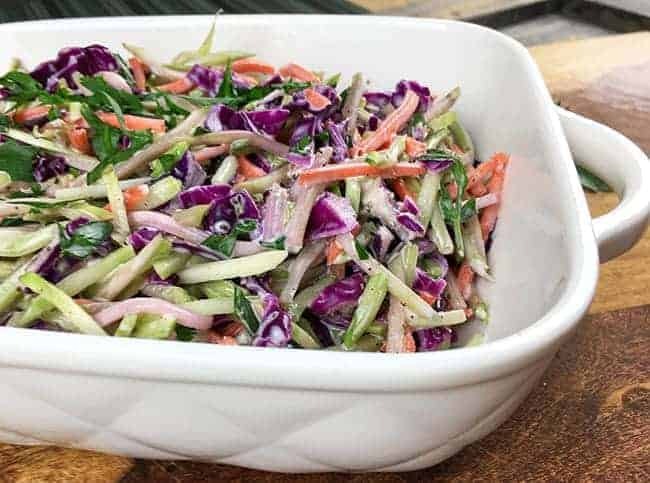 As I said earlier, you can serve this slaw right away, but I find the flavor is best when it can sit in the refrigerator for a few hours or even overnight. Let’s be social! Follow me on Facebook, Pinterest, and Twitter! Add all ingredients to a large glass bowl or casserole dish. Toss to combine. Enjoy right away or if you have the time, cover and let it sit in the refrigerator for a few hours or overnight. If you want to shred your own broccoli stalks instead of buying pre-made broccoli slaw, then simply julienne 4-5 broccoli stalks or shred them with a box grater. If desired, julienne or shred a couple of carrots, as well. Place all ingredients in a glass bowl or casserole dish. Season with salt and pepper, to taste. Stir well. Serve right away or cover and let sit in the refrigerator several hours or overnight. This recipe is already low carb! Only 3.6 net carbs per serving! If you try this recipe, let me know! Leave me a comment…I’d love to hear from you! Try some of my other recipes! Crunchy Romaine Toss Salad is great, light salad side dish. Perfect for summer. Lemon Chess Pie is a southern classic dessert. Tart and sweet! A great summer dessert recipe. Blue Cheese Stuffed Hamburgers are great on the grill! Goes great with broccoli slaw!